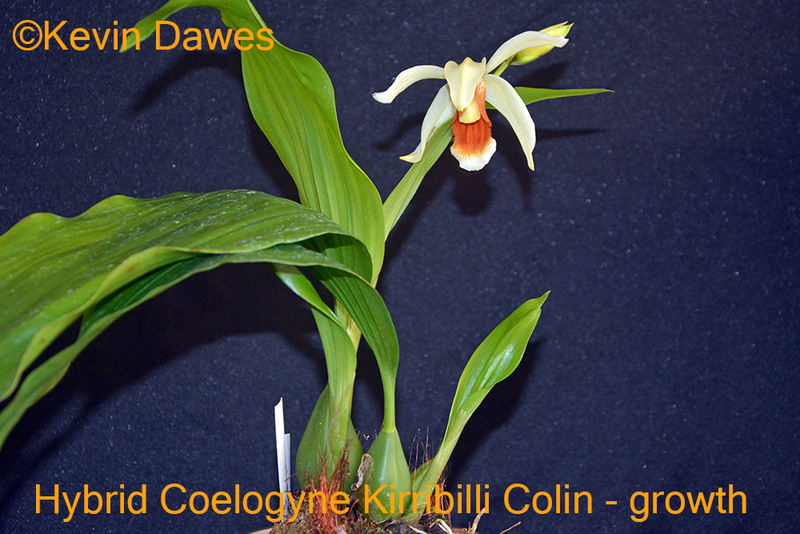 Coelogyne Kirribilli Colin (2016) is one of my efforts to demonstrate that not only primary Coelogyne hybrids are possible but secondary hybrids are also possible and easy to produce using Coelogynes. A primary hybrid is one made by cross-fertilising two species plants. This has previously been rumoured to be difficult with Coelogynes. A secondary hybrid has the introduction of the genes from yet another species. In this case a hybrid made by crossing CoeIogyne lawrenceana with Coelogyne mooreana 'Brockhurst' has been crossed with a pure species Coelogyne usitana - thus, we have a new hybrid combining the genes of three different species. The hybrid pod (mother) parent, Coelogyne Memoria Wilhelm Micholitz, was made and registered in 1950 by Sanders and Sons, St Albans (U.K.). In my opinion, it is one of the most desirable Coelogyne hybrids. It produces a good flush of very large, long lasting flowers over a few of months. It is not up to the cut-flower market requirements e.g. Cymbidiums or Phalinopsis, but for a normal house type plant it is exceptional. I have been keen to try this orchid as a hybrid parent. The pollen (father) parent is Coelogyne usitana 'Golden Gate'. This is a very new (2001) orchid species in the cultivation world and still difficult to obtain because it is so highly sought after for its incredibly dark colouring. Although each spike only produces one flower at a time the spike continues producing up to 20 single flowers over many months. The flowers are a good size and the plant should make an interesting hybrid parent. It has had a large positive influence on its hybrids. Its one negative gene that does carry through, unfortunately, is the downward facing habit of the flower. I have some hybrids on the way using Coelogyne celebensis which might overcome this fault a bit but this area is an exciting challenge for our younger growers! The very dark inner throat colouring (sometimes even bright red) , the numerous keels and the dullish browns sepal/petal colouring from Coelogyne lawrenceana seem to have been totally suppressed in this hybrid, leaving little hint of its background. From Coelogyne mooreana the large petals and sepals have maintained a pleasant white colouring but with a tiny tint of green from its Coelogyne usitana parentage. Coelogyne usitana has had a major impact in spreading the beautiful orange/tobacco colouring over extensive areas of the inner lip and over much of the outer lip. As in the case of Coelogyne usitana itself, this extensive colouring fades with maturity to a rich light tobacco colour. This trait is a very important feature of using Coelogyne usitana as a breeding parent. Although the spike makes a weak effort to be upright, the huge 11cm wide flowers are almost completely downward facing. A saving grace is that the other parents have contributed to making a very open flower. The synanthous flowering habit is not surprising considering two of the parents display this trait. The broad leaves with numerous prominent veins and the deciduous bracts are traits common to all three parents. I pollinated this cross on 16.8.2010 and flasked it almost exactly 12 months later on 8.8.2011. It was just over a year later on 16.9.2012 that I deflasked it and then around 41 months till it flowered for the first time on 20.2.2016. This is fairly typical timing based on my experience with Coelogynes. The first seedling has produced two nearly simultaneously opening flowers and an aborted terminal bud. This same plant developed more sequential flowering habits as it matured over a couple of years. It produces many spikes and holds an impressive flower display of very large flowers over many months. Negatives: There is minimal perfume. The often nice perfume from the grandparent, Coelogyne mooreana, is missing. None of the inherited genes have done anything to help produce an upright facing flower. Future breeding of Coelogynes needs to be much more adventurous and introduce a wider range of species. My early attempts have concentrated on the small pool of big, well-known species and as a result I have produced a certain sameness among several of my hybrids. My Coelogyne Kirrribilli Stephanie, using the pale green Coelogyne brachyptera, is an example of future exciting possibilities. Orchideengarten (Germany) has registered a new hybrid using the spectacular green and black Coelogyne pandurata crossed with the popular cascading white Coelogyne cristata. New hybrids like this will have mammoth future impacts. Coelogyne Kirribilli Colin has been named after my brother Colin Dawes who, along with his family, has so successfully carried on the ownership and management of the traditional Australian family rural agricultural property Kirribilli. Rating: ♦♦♦♦♦ This new hybrid has a huge potential. 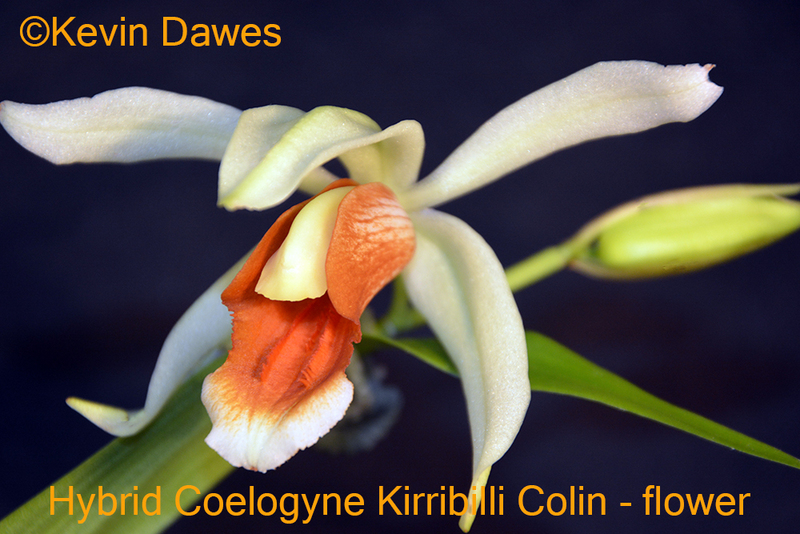 Registration: Registration with the RHS as Coelogyne Kirribilli Colin was recorded in February 2016.